Hai friends. Welcome to AYESHA'S KITCHEN. 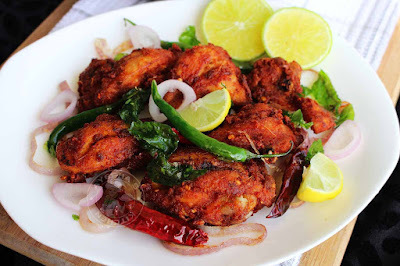 Today lets make a Kerala street food style chicken fry today. 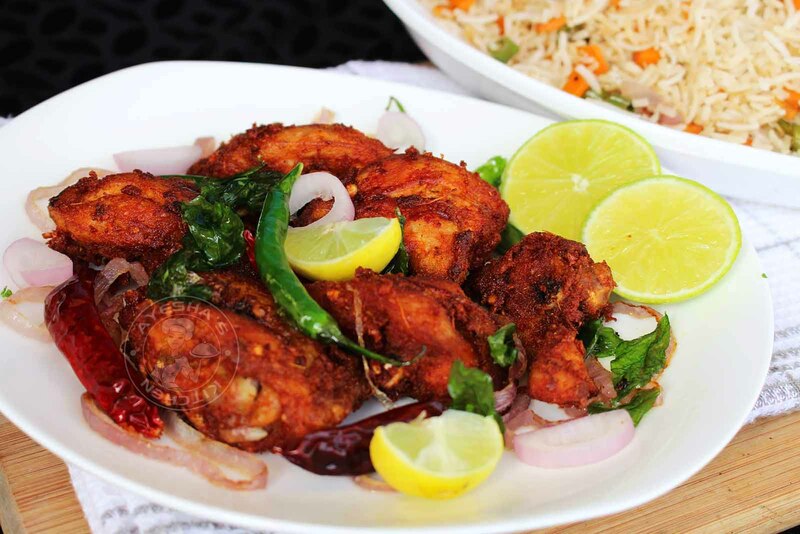 We all know that Kerala dishes are very popular around the world because of its unique taste and flavor. Keralites use natural taste enhancer to make their dish irresistible. The use of curry leaves, fried onion, fried chilies, coconut oil gives the dish an authentic taste of Kerala. 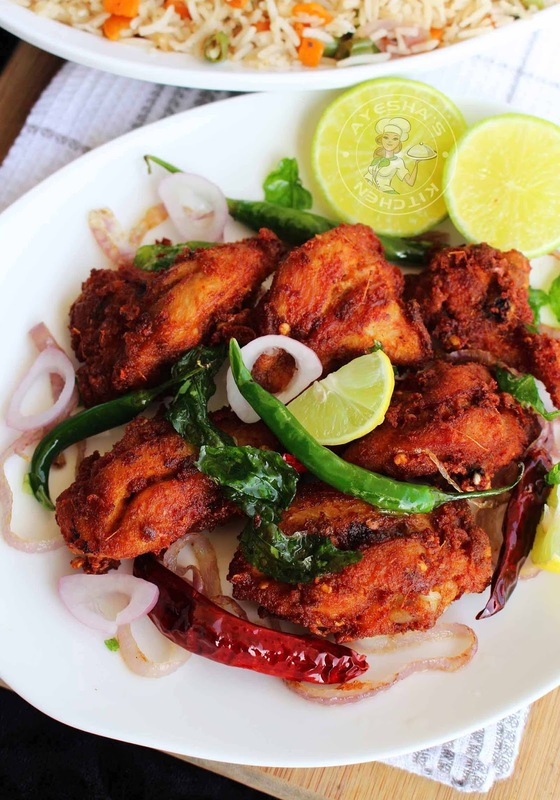 Kerala thattukada chicken fry/street food style chicken fry is a special chicken fry recipe from South Indian state which is spicy and has distinct flavor. Street food / Thattukada is a small roadside food stalls selling hot delicious dishes. This local street food stalls in Kerala will be open in the evening and the main attraction will be poratta, beef fry, dosa, omelette, chicken fry, meen mulakittath, chicken ularthiyath like so. Though the food tastes awesome, we can't assure the quality and cleanliness. So why can't we go for a copycat recipe of the same at home? Food and movies, me and hubby's best way for entertainment. So we love to taste food from such food stalls/street vendors. The dishes of roadside vendors will be spicy and sometimes I can't bear that much heat. So lets see how to make Kerala thattukada style chicken fry recipe/chicken varuthathu / chicken porichath / spicy tangy chicken fry / simple chicken fry / yummy chicken recipes/chicken fry recipe / fried chicken / Indian street food recipes/ street food vendors chicken recipes. Grind together all the ingredients given under ' for grinding ' to a smooth thick paste. Do not add water while grinding. When done, heat a nonstick deep bottomed pan and add oil for deep frying. Once the oil turns hot, fry the onion rings and set aside. Then fry green chilies, red chilies and curry leaves. Set aside. (be careful while frying chilies). Now add the rice powder to the marinated chicken and combine well. Add each chicken pieces to the hot oil and fry both sides until golden and crisp. Fry in batches. Transfer to a serving plate along with the fried ingredients and serve hot. Yummy. NOTE : Always use chili powder and dried red chilies as per your heat tolerance. I am using Kashmir chili powder which is very less hot compared to normal chili powder.